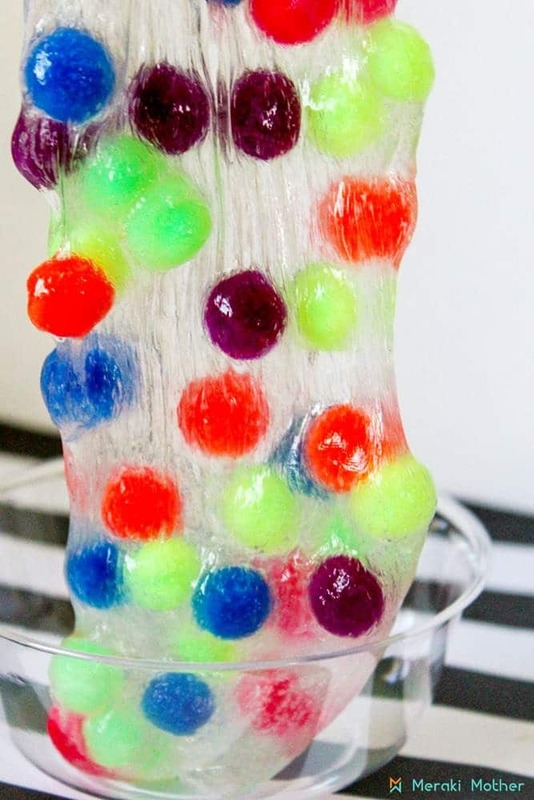 Looking for an easy slime recipe to get the kids entertained and involved in sensory play this summer? 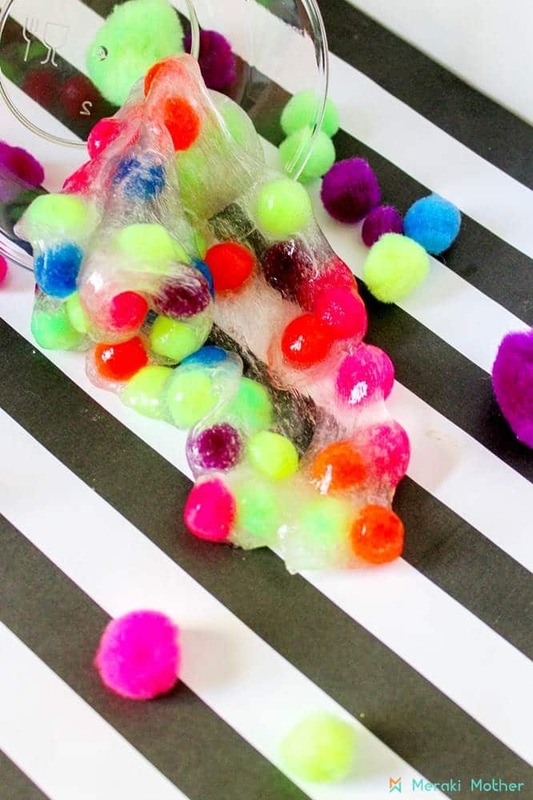 Follow our easy steps below for a cool clear pom pom slime. 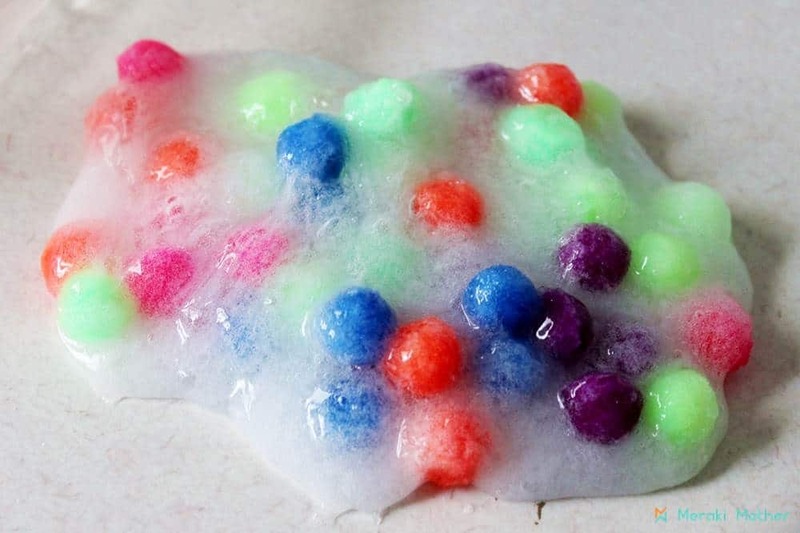 We play with slime all the time and have tried quite a few out of the ordinary slime recipes. They are just great during summer for when the kids get tired of playing outside with their water toys, or if they just need a break from all the sun! But if you don’t know where to buy slime, you don’t have to worry. The good news is that you don’t have to buy it, you can make it yourself at home. This way you know exactly what goes in. 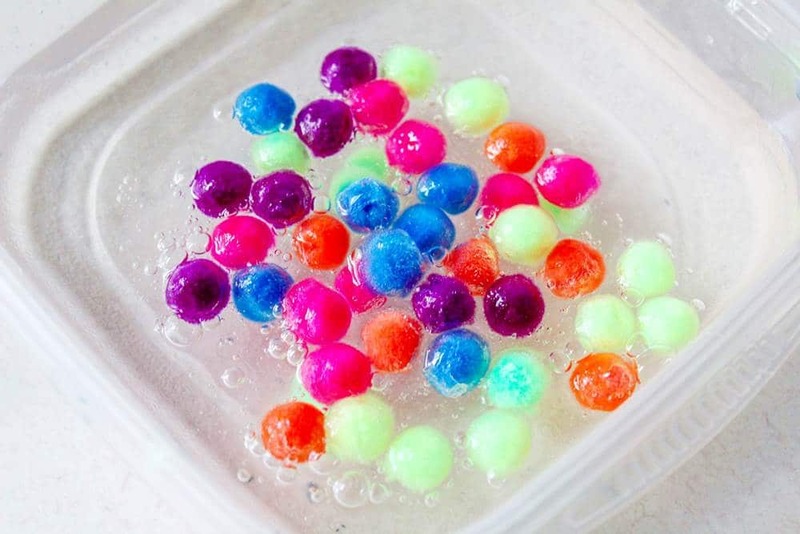 In fact making a new batch of slime is always on our summer activities bucket list. I just stock the house with some borax and Elmer’s glue so I always have it at hand! 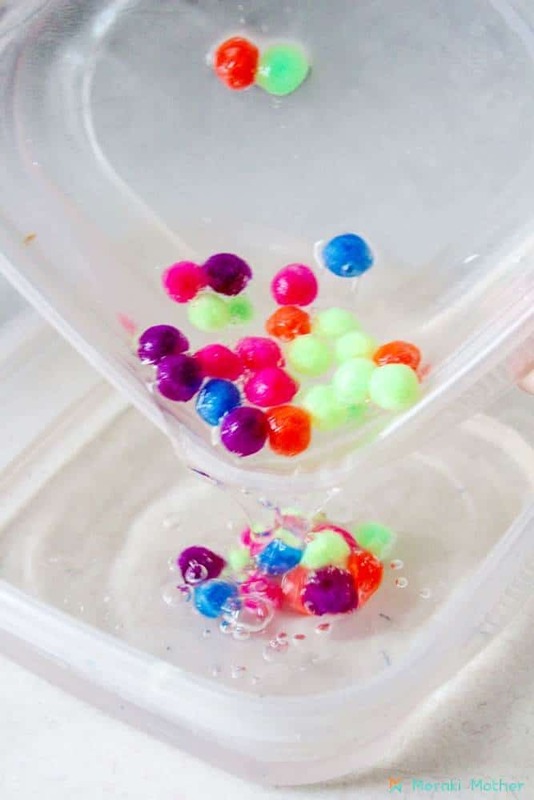 There will be no boring down time at home when you can make slime for kids, or playdough with them! Why we love this slime? Well it adds a new texture to the slime and we are all about making it sensory friendly and trying different activities for sensory play. 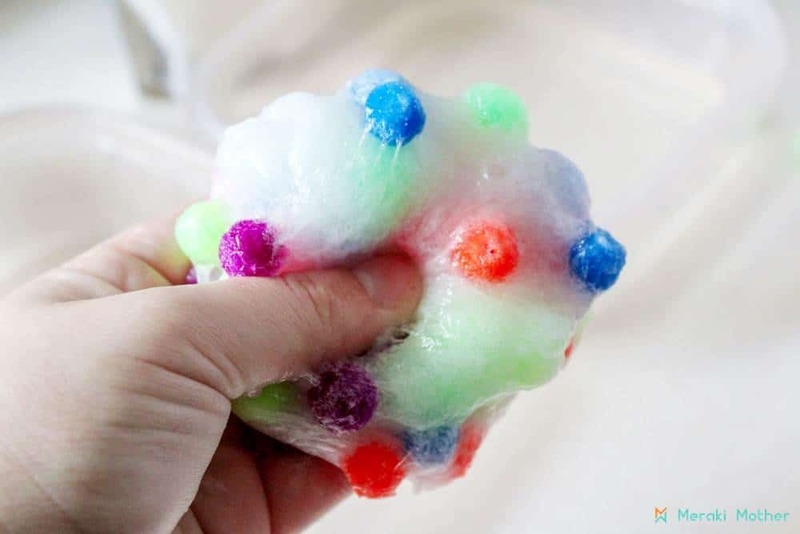 However, the pompoms could be replace with other sensory add-ons, such as sequins, glitter, or magical eraser like we have used in the past, on our pineapple slime. Just be sure to watch small children all the time so nothing ends up in their mouth, the slime is also not edible! So get your supplies together and enjoy making this simple recipe with the kids. Step 1: In a container, pour 1 cup of hot water. 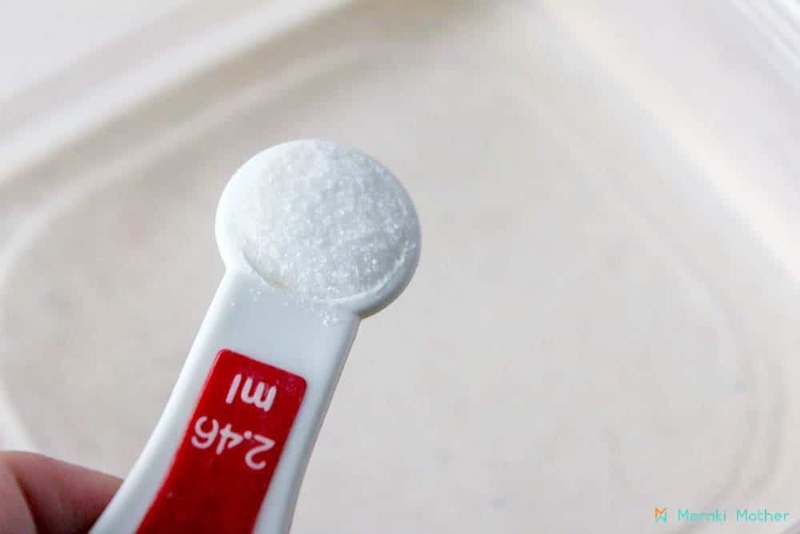 Then add ⅓ tsp of borax and mix well. Step 2: In a second bowl or container, fill it with ¼ cup room temperature water. 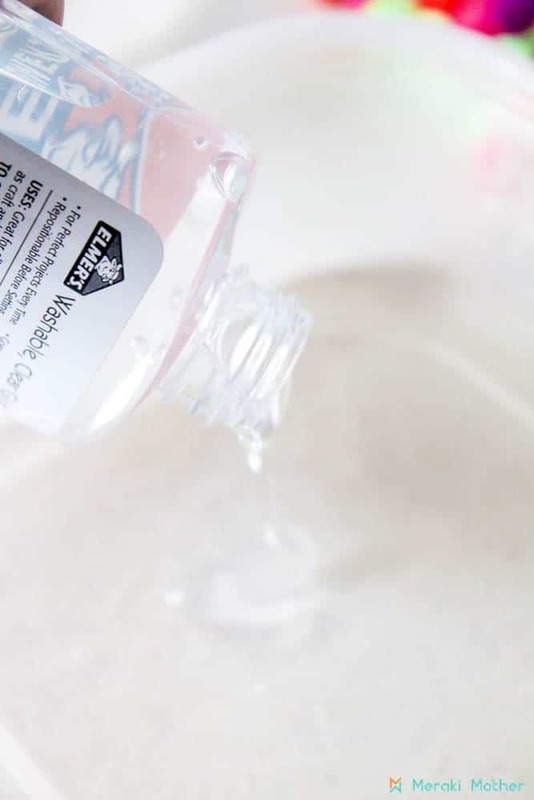 Then squeeze an entire bottle (5 oz) of clear glue. Step 3: And add your pom poms! If you want to add color or glitter, this is the time too. make sure to mix it well. Step 4: Now pour your entire water/glue bowl into the first bowl of borax and water. You will immediately see the slime begin to form. Step 5: Let it sit for about 30 seconds to a minute and wipe out your empty bowl. Step 6: Pick up your slime from the water and borax solution and transfer it to your empty bowl. It will be sticky at first! That’s totally ok! Knead it and it will thicken up and finish forming. If your slime is still way too sticky, splash a bit of the borax water on it and continue to knead. That is my go to ever time I want to make slime less sticky. For this recipe it works wonders! At first your slime will appear a bit cloudy but it will clear up once you begin to play with it. And it is ready!! Don’t forget to store in an airtight container after play. Softest Cloud Dough Recipe Ever. Easy no cook Play dough.